Close your eyes. Go back to your childhood days. Arabian Nights was your favourite story. Now slowly open your eyes. Lo, you are in the magical world of Arabia. Hey, I thought we were headed to Bidar fort! Same thing, actually. The origin of this fort is rather fuzzy. The ASI board at the entrance says that the fort was built by the Kalyani Chalukyas around 1st Century A.D. Subsequently, it passed through several hands. 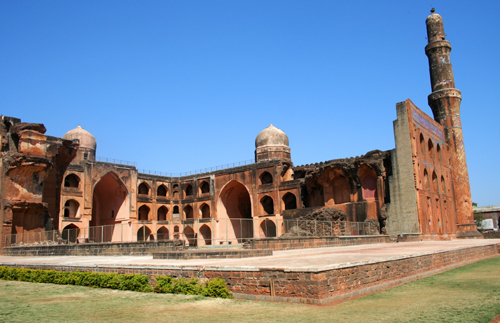 In 1424, Ahmad Shah Wali, the ninth Bahamani emperor, shifted his capital from Gulbarga to Bidar. It was under the Bahamanis that the fort rose to prominence, and acquired a character that would wow a 21st century tourist. The architecture in Bidar is different from that of Gulbarga. While Tughluq touch is evident in Gulbarga, there is a distinct Persian influence at work in Bidar. For the Deccan, which occupies the central part of the Indian peninsula, attracted Persian settlers in large number. Bidar has an old town and a new town. The good hotels (most of them, anyway) are concentrated in the new part; no prizes for guessing where the fort lies. A 15 minute rickshaw ride up to the main entrance will cost you about Rs. 25 to 30. But it’s better to hire a rickshaw for the entire excursion, as the fort is huge and there are many places to be seen within. That’s exactly what I did. My rickshaw driver, Rahim, charged Rs. 150 for what turned out to be a three hour trip. What I got in return was a nearly comfortable ride in a front-engine rickshaw and a friendly driver who spoke Hyderabadi Hindi, but was notoriously deficient in elementary knowledge of local monuments I was looking for. The road to the main entrance runs parallel to the fort, giving a nice view of the outer ramparts. Polygonal bastions with bold crenellation, and a wide moat with rock cut trenches give this fort a jagged, formidable look – one that means business… of guarding what’s inside. The sound of the wind dominates the wide expanse within the fort. The wind seems like an agent of time, hitting the crumbling walls furiously. Even in this losing battle the walls maintain their dignity, displaying the skills and tastes of men long before our time. The men of our times, well, love cricket! The Bahmani connoisseurs were no doubt admirers of woodwork too. That they would have approved of the willow at Takth Mahal, I’m not so sure! The spirited boys of Bidar have found an excellent indoor stadium to play cricket in Takth Mahal! The Diwin-i-Am lies in near complete ruins, but what’s left of it is enough to transport you back 600 years. Some distance from the Takth Mahal and Diwan-i-Am is the Lalbaug complex. The high arches of the Tarkash Mahal peer over this complex from the south. The complex, itself, has a well-maintained garden. On the Western side runs the Solah Khamba mosque, where conservation work is now underway. To the North, there’s a not-too-impressive museum – by the description gleaned from books, I figured out that 5 centuries ago, this must have been the royal baths. Further down is the Rangin Mahal (it is actually the first building as soon as you enter the fort. I, on the other hand, visited the farthest point first). This building is sometimes closed, but is opened on request. The six bay hall of the Rangin Mahal has wooden columns with exquisite carvings. The building derives its name from the mosaic tile patters and mother-of-pearl inlay decoration adorning the walls of the mahal. A 5 minute drive away from the fort is the madrasa built by the greatest minister of Bahmani Empire, Mahmud Gawan. (The madrasa is locally known as Gaajina kambha). You do not get more Persian than this. A tall minaret dominates the multi-storey building. Traces of coloured tiles on the minaret can be seen to this day. In its heydays, the college had a library with 300 books, and attracted scholars from far away Persia. Part of the building was destroyed by an explosion which exposed a trapezoidal pillar. In a strange way the scar adds beauty to the building, which about sums up the Bidar experience. This article appeared in Spectrum, Deccan Herald. From Hyderabad – There are regular buses from Hyderabad to Bidar. The journey takes around 3 ½ hours. From Banagalore – There are buses between Bangalore and Bidar including Volvos. The journey takes around 10 hours. Alternatively you can travel by train up to Gulbarga, which is only 3 hours away by road. Hotel Kamat, Udgir Road, Bidar. This entry was posted in deTour, Places. Bookmark the permalink. I liked the picture of Mahmud Gawan’ madrasa. THis is a rare view, generally not included in books. The structure towers over you and and at the same time it circles you. I liked the picture of Mahmud Gawan’ madrasa. This is a rare view, generally not included in books. The structure towers over you and and at the same time it encircles you.